Love the way the colours are splashed about and the design. It’s time for a new challenge over on The Artistic Stamper Creative Team Blog. This month’s theme is Circles. As usual, there will be candy for one randomly picked entrant – £15 worth of The Artistic Stamper stamps of your choice plus the Kling On to mount them onto. And… if you use Artistic Stamper stamps on your entry, you will be entered twice into the draw! I decided to alter a CD into a hanging. I made a colourful background on a sheet of watercolour card, using Dylusion Spray Inks, then cut a circle to fit on the CD. 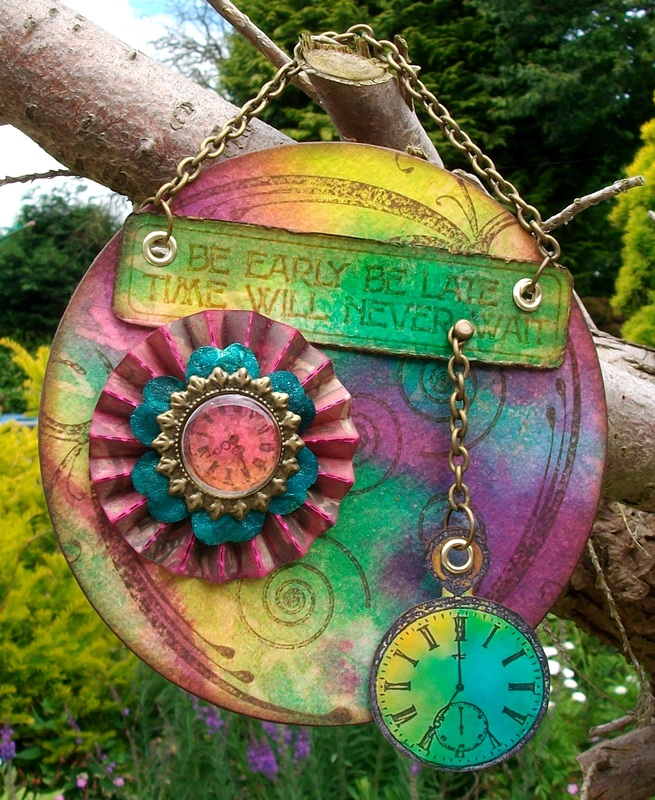 I stamped Swirls & Whirls from the Swirls, Splats & Dots & Tick Tock plates, then glued the circle to the CD.